L’Arche has a unique vision of care giving and community building that fosters inclusion and belonging. In nearly 200 small homes and day settings across Canada, assistants and friends from diverse cultures and backgrounds and people with intellectual disabilities share life together. 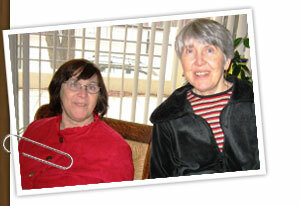 In L’Arche, friendships form easily and some of these friendships last a lifetime. We know how important good friends and a feeling of belonging are for each of us. Why did we create iBelong!? At present, very few resources exist to aid those with intellectual disabilities to learn about and actually form satisfying, mutually enriching friendships. L’Arche Canada has created this online resource because we want to help all individuals with disabilities to have lasting friendships. This website brings together some of our learning in L’Arche and the practical wisdom, good practices and resources of some other people and organizations who generously contributed in various ways. The research phase for the iBelong! project was carried out across Canada from January to April 2010. Secondary source research was performed by examining existing resources, publications and reports. Primary research was then completed through two main methods: qualitative interviews and online surveys. These were available in English and in French. We had a good representation of family members, teachers, and young people with disabilities in the responses from both language groups. The young people were eager to talk about their friends and the activities they like to do with these friends. Almost all responses from the young people surveyed were positive, but some declined to respond to the survey because they lacked friends. Overwhelmingly, educators talked about the loss of social contacts and friendships after the young people leave high school. Educators also lamented the scarcity of places where friendships can form with students who do not have disabilities—the lack of integrated activities or programs. Another important theme was the difficulty young people with intellectual disabilities have in forming friendships due to lack of social skills. Also mentioned by teachers was the fact that young people need a significant amount of support in forming and maintaining friendships, particularly with transportation to activities and in communication and organizing encounters. They stated that this support usually comes from their family and depends on the family’s circumstances. Most parents spoke about their desire for more friendships for their son or daughter. Some had hope and good advice to give, but most expressed great frustration and pain in their responses. Many talked about the fact that friendships do not continue outside of the school setting and organized school activities. A great number mentioned the lack of acceptance of their sons and daughters by other youth. Another important concern was that their son or daughter lacked friends in their own age group. *Click here to read the16-page report on this research.